Shakespeare’s work encountered some difficulty in crossing the Atlantic. In 17th-century America, Puritans and Quakers opposed the theater, and in 1682, William Penn authorized severe punishment for stage plays, which he placed in the same category as dice and bear-baiting. The earliest surviving evidence of a Shakespeare performance in America is a 1730 advertisement for Romeo and Juliet in New York; by 1752, Lewis Hallam’s “London Company of Comedians” had arrived in Williamsburg, Virginia, where they attracted audiences of legislators and merchants. Between 1750 and 1774, 15 Shakespeare plays were known to have been staged in America: the most popular were Romeo and Juliet, Richard III, and Hamlet. In 1774, the Continental Congress prohibited theater, although the ban was never entirely successful. In general, the Loyalists (colonists who remained loyal to the British crown), and, later, the Alexander Hamilton led Federalists (who favored cordial relations with Britain), supported the theater, while Anti-Federalists opposed it. During the Revolutionary War, the restriction on theater essentially created an embargo on British culture. In the post-Revolutionary period, the theater became a site of conflict over who had authority to shape the cultural life of the new nation. By the late 1780s, anti-theatrical laws began to be repealed and by 1794 new playhouses were built in Boston and Philadelphia. During the second half of the 18th century, newspapers and broadside playbills advertised performances. Although thousands of broadside playbills were printed, very few survive. The playbill for a 1799 performance of Macbeth, does not specifically mention a location, but the printer, bookseller, and newspaper where tickets could be obtained were all located in Alexandria, Virginia. George Washington, an avid theatergoer, lived nearby at Mount Vernon, and though there is no record of him at this performance, it is possible that he attended. I look upon the Tragedy of Hamlet as the Master Piece of Drama—The Master Piece of Shakespear—I had almost said the Master Piece of the Human mind. [Hamlet] is Man in the ideal perfection of his intellectual and moral nature, struggling with calamity beyond his power to bear, inflicted by the crime of his fellow man—struggling with agonizing energies against it—sinking under it, to extinction. What can be more terrific? What can be more piteous? Nearly 25 years later, Hackett corresponded with Abraham Lincoln, who wrote that he favored Macbeth over Hamlet. Some of Shakspeare’s plays I have never read; while others I have gone over frequently… Among the latter are Lear, Richard Third, Henry Eighth, Hamlet, and especially Macbeth. I think nothing equals Macbeth. It is wonderful. On Saturday, October 17, of that same year, Lincoln attended a performance of his favorite play at Grover’s Theater; the playbill from that night is featured here. While Lincoln enjoyed professional theater, amateur productions thrived as well. In 1863, 13-year old John Allen Hosmer of Ohio prepared a playbill for a private, or perhaps imaginary, night of theater, featuring a (rather ambitious) program of Richard III, Macbeth, and Hamlet. The following year, Hosmer moved with his family to Montana Territory, where he carried on his theatrical pursuits, appearing as King Edward IV in Thomas Heywood’s play of the same name. Shakespeare was also found in elocutionary handbooks, which presented individual scenes or speeches intended to be read aloud as a means of learning to speak well in public. One of the most popular manuals was William Scott’s Lessons in Elocution. Many Americans—including Abraham Lincoln—learned their Shakespeare from Scott. On May 10, 1849, New York City witnessed its deadliest riot to date, sparked by the rivalry between American Shakespearean actor Edwin Forrest and his English counterpart, William Charles Macready. Forrest had met great success performing in England as well as America. When Macready toured America, Forrest followed him, performing the same roles, and the press promoted a rivalry between the two, rooted in culture and class: the upper-class Englishman versus the working-class American. When Forrest returned to England in the 1840s, the conflict intensified, with Forrest hissing and jeering Macready on stage, and Macready claiming that Forrest had no taste. In 1849, Macready was booked to perform Macbeth at the luxurious Astor Place Opera House, then managed by the American actor, writer, and once and future presidential correspondent James Henry Hackett. Forrest was engaged to act in the same play a few blocks away at the Broadway Theatre. While performing on May 7, Macready was jeered by fans of Forrest, who threw rotten eggs and vegetables at him. He left the stage and announced he would return to England. Many of New York’s cultural elite, however, including the authors Herman Melville and Washington Irving, petitioned Macready to stay. Three nights later, a huge anti-Macready crowd gathered outside Astor Place Opera House, undeterred by the presence of police and militia. The crowd grew unruly and attacked the militia, who responded by firing into the crowd, leaving at least 22 people dead and hundreds more wounded. Macready escaped the chaos in disguise and returned to England. After James Henry Hackett realized that he possessed a talent for making people laugh, he abandoned his career as a grocer, moved to New York City, and took to the stage. He first captured attention in the role of Rip Van Winkle, performing in a popular adaptation of Washington Irving’s short story. In the 1830s, in a bid to expand his repertoire, Hackett started to perform some of Shakespeare’s plays, appearing for a time as Iago in Othello. Hackett’s real gift, though, was comedy, and he eventually settled into the role for which he won the most acclaim: Falstaff in Henry IV and The Merry Wives of Windsor. Artists immortalized Hackett in this role in numerous prints and paintings. In the 1850s, John Tallis, the London-based publisher of maps and views, capitalized on the relatively new medium of photography by publishing dozens of engravings based on photographs of actors posing as the characters they played on stage, including Hackett as Falstaff. The prints fed the enormous Victorian desire to possess photographic likenesses and brought a new kind of celebrity to performers. Victorians also loved Staffordshire figurines, named for the county in England in which they were made, beginning in the 18th century. The middle classes were keen to decorate their homes with objects similar to costlier figurines, and Staffordshire potters obliged them by producing all kinds of animals, as well as literary figures, celebrities, politicians, and kings and queens. Many actors appeared in glazed earthenware form, including James Henry Hackett as Falstaff, modeled after the engraving published by John Tallis. The flat back of the figurine was intended to be placed against a mantel top, with Falstaff facing outward and adding ceramic cheer to the room. Laying claim to the most-beloved actor of the American stage and the assassin of President Abraham Lincoln, the Booth family forever altered the landscape of culture and politics in 19th-century America. Born in London, Junius Brutus Booth, Sr. (1796-1852) decided on a career in the theater by his late teens. After touring in the provinces, he made his London debut in 1817 at Covent Garden in the title role of Richard III. Edmund Kean, at that time the foremost tragedian in England, played the same role at Drury Lane that same year, prompting critics and playgoers to argue the merits of each actor. This anonymous satirical print depicts the rivalry; with the two actors almost equally balanced on a scale, it seems to suggest that the real winners are the shareholders of the two theaters, represented by the “Box Office” in the foreground of the print. Although Kean was widely regarded as the more talented of the two actors, he saw Booth as a threat and often tried to perform in competing productions. Similar rivalries occurred throughout the century, most notably between Edwin Forrest and William Charles Macready, which resulted in the deadly Astor Place Riot in 1849. Partly because of his rivalry with Kean, in 1821 Booth emigrated to the United States, settling in Maryland. In less than a year, he became the most prominent actor in the United States. With his second wife, Booth had 10 children, including 3 sons who were also actors: Junius Brutus Booth, Jr. (1821-1883), Edwin Booth (1833-1893), and John Wilkes Booth (1839-1865). Many consider Edwin Booth to be the greatest American actor of the 19th century. Edwin made his stage debut at age 13, alongside his father (whom he accompanied on tour in an effort to stop him from drinking) in Richard III. In 1851, when his father was too ill to appear on stage, Edwin took his place in the title role. Immediately afterward, he began a production of Hamlet, which came to be known as the “hundred nights Hamlet,” setting a record for consecutive performances of the play that lasted until John Barrymore broke it in 1922. 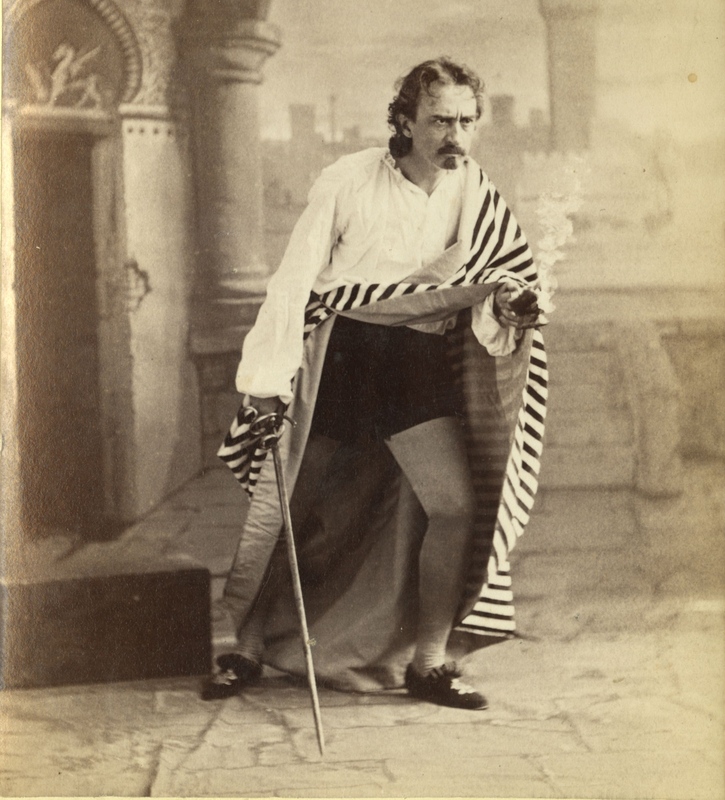 After his brother’s assassination of President Lincoln in April 1865, Edwin Booth abandoned the stage for over a year, but returned in Hamlet in New York in January 1866. From 1863 to 1867, Edwin Booth managed the Winter Garden Theatre in New York City, staging mostly Shakespearean tragedies. After a fire there, Booth built his own theater in Manhattan, which opened on February 3, 1869, with Romeo and Juliet. The production starred Booth as Romeo, and his second wife, Mary McVicker (daughter of Chicago theater manager James McVicker), as Juliet. Elaborate productions followed, but the theater never became profitable. Booth returned to touring and his final performance was, fittingly, as Hamlet, in 1891 at the Brooklyn Academy of Music. In 1864, before he assassinated Lincoln, John Wilkes Booth appeared with his two brothers, Edwin and Junius Brutus Booth, Jr., in Julius Caesar in 1864 (John Wilkes played Marc Antony, Edwin played Brutus, and Junius played Cassius). This performance was the only time that the three brothers appeared together on the same stage. The production was a benefit, organized to raise funds for a statue of William Shakespeare, which still stands in Central Park just south of the Promenade. By 1857, actor and theater manager Charles Kean was known for lavish productions using historically accurate costumes and sets. With The Tempest, though, he apparently felt himself free from the confines of any specific historical period and at liberty to exercise his imagination. Kean’s resulting production was arguably the most elaborate version of The Tempest ever staged: it took five hours to perform and required over 140 stage hands to move the scenery. The play drew unanimous raves from the press, who conceded that the acting was secondary to the spectacle. One manuscript promptbook served as a “final” or “souvenir” book made by T.W. Edmonds, the prompter at the Princess’s Theatre in London. In addition to stage directions such as entrances and exits, it contains cues for elaborate effects and timings, as well as watercolor designs for 14 scenes. Capitalizing on the popularity of the production, a printed version of the promptbook was also published. By the late 19th and early 20th centuries, Shakespeare was popular enough to sell just about anything, from soap, to clothing, to corned beef, to beer, to cars. In 1871, Shakespeare was even used to sell business services, as with this directory from Providence, Rhode Island, The Shakespearian Advertiser. The publishers commissioned comic illustrations of Shakespeare quotes that were then interspersed between advertisements for Rhode Island and Massachusetts businesses, in the hope that they would entice people to look through the entire booklet and pass it along to friends. Shakespeare-related advertising also took the form of trade cards. Although advertising trade cards date back to the 18th century, in 19th-century America they became sought-after in their own right. Often presented as a series of give-aways, with a brightly colored picture on the front and an advertising message on the back, manufacturers designed the cards to encourage customers to collect the series. One popular series advertised Dobbins’s Electric Soap using the “Seven Ages of Man” speech from As You Like It. Some series played on the era’s popular sentimentality, casting children in well-known Shakespeare roles, as in the card for Dr. King’s New Discovery for Consumption, Coughs, and Colds. Advertisers also issued parody cards, altering quotes and scenes to make it seem as if Shakespeare himself were endorsing the product. Parodies were popular with meat companies: Libby’s canned meats find their way into Hamlet, where the gravedigger snacks on ox tongues while Hamlet memorializes Yorick; and Julius Caesar, with Brutus encouraged to fatten up Cassius on corned beef. The Leibig Company also used Hamlet to promote their meat extract—choosing, surprisingly, a scene from the play describing poison. Why don’t she wash her hands, b’gosh! With Ivory Soap”? cried Uncle Josh. Some Ladies indeed have shewn a truly public Spirit in rescuing the admirable, yet almost forgotten Shakespear, from being totally sunk in oblivion … in preserving the Fame of the dead Bard, they add a Brightness to their own, which will shine to late Posterity. The bust was an immediate success, and soon a replica of it appeared on stage, in the pantomime Harlequin Student, which celebrated the triumph of “highbrow” English drama over the Italian Harlequin genre. In 1769, David Garrick announced plans for a Jubilee celebrating the bicentenary of Shakespeare’s birth (the fact that the anniversary had actually occurred five years earlier did not deter him). Held in Stratford-upon-Avon, the Jubilee was the first time Shakespeare was celebrated in his home town. Visitors flocked to Stratford for a pageant of Shakespearean characters, a masquerade ball, music, and fireworks. Notably, not a single line from any of Shakespeare’s play was performed. The Jubilee was widely satirized, but it marked the beginning of an industry of “bardolatry” that continues to this day. Since the Jubilee, Shakespeare devotees have continued to commemorate him with objects both decorative and practical: in the 19th century, one could record the birthdays of friends and family in an illustrated Shakespeare Birthday Book; in 1964, one could send birthday greetings with a Shakespeare postage stamp, printed for the 400th anniversary of his birth. In 1864, the tercentenary of Shakespeare’s birth sparked a variety of publications and celebrations; Stratford-upon-Avon again held a multi-day celebration. Enthusiasts who could not travel to Stratford could join the celebration from afar. Theater-goers could see a special tercentenary performance of Twelfth Night at the Haymarket Theatre in London, while the new medium of photography allowed fans around the world to view images of Shakespeare’s birthplace and home, fueling both the tourism industry in Stratford and the market for illustrated guides and souvenir publications. In April 1916, popular magazines devoted entire issues to the 300th anniversary of Shakespeare’s death. Life included serious essays, poems, photographs, and comic illustrations. Theatre Magazine, a source for information, reviews, and gossip about contemporary theatrical productions, included a page of photographs documenting performances staged on high school and college campuses around the country to celebrate Shakespeare. The University of Chicago’s English department chose to perform Nice Wanton, an anonymous “interlude” from the mid-16th century, presenting the tragic story of three children, two bad and one good. Interludes, which grew out of medieval morality plays, featured characters personifying virtue and vice; the vice characters strongly influenced Elizabethan drama, inspiring Shakespeare’s Iago and Richard III. James Boswell (1740-1795) attended (and was delighted with) the Jubilee. Best known as Samuel Johnson’s biographer, Boswell called the celebration “an elegant and truly classical celebration of the memory of Shakespeare.” Thanks to the recent publication of his Account of Corsica, a memoir of his travels and acquaintance with General Pasquale Paoli, the leader of the Corsican independence movement, Boswell was enjoying a moment of minor celebrity. He saw the Jubilee as a chance to capitalize on his fame as well as mingle with various ladies before his impending marriage. During the Jubilee, a print shop was set up in Stratford so that festival-goers could have their own verses published should the mood strike them. Boswell saw this as a great opportunity and wrote verses recounting a Corsican narrator’s pilgrimage in honor of Shakespeare. Boswell hoped to hand out the printed verses at the masquerade ball (which he attended in Corsican dress), but because the printer finished them so late, he was not able to do so until the next day. Upon returning to London, Boswell arranged for his costumed picture to be engraved for the London Magazine, which the magazine printed along with his verses. The letter in the magazine that accompanied the picture and verses proclaimed Boswell “one of the most remarkable masks upon [the] occasion.” This letter was actually–in true Boswellian fashion–written by himself.